We are an authorized dealer of Westone ear protection products. Why Custom Ear Mold and Fitted Hearing Protection? No ears have the same shape and size and, as a result, no one product will fit all ears the same. Custom molds and hearing protection allow you to comfortably wear ear plugs for various purposes without feeling pain or having them fall out of your ears. It is crucial that these devices fit in your ears correctly, so that they do not fall out, do not hurt your ears and perform to the standards required/wanted by the user. From swim plugs to noise plugs, comfortable, custom ear and hearing protection is something all age groups should be utilizing in our noisy world to safely enjoy all activities that expose the ears to loud sounds. Resonance Audiology is an authorized dealer of Westone custom ear mold and ear plug products. These are the two variables that determine how much sound is too loud and how long can a person listen to that sound until the ears become damaged. Very loud sounds can cause permanent hearing loss in an instance (gunshot) or may take a longer time to result in permanent hearing loss (going to too many loud concerts, working in a loud environment). It is important to understand the length of time that one can be exposed to different noise levels and if they are going to be exposed for lengths longer than they can bear, it is crucial that they utilize noise protection to protect their hearing. 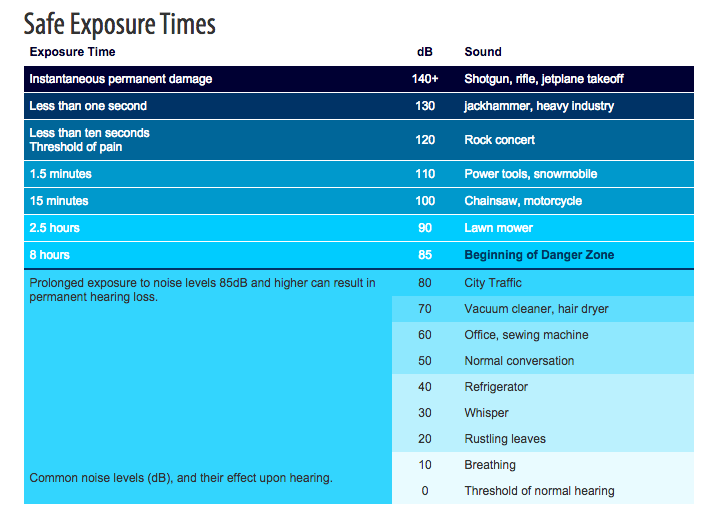 Please see the chart below provided by Weston that shows what sound levels can cause hearing damage at certain amount of times. The CR10 is for active individuals who love their music and want to upgrade from stock stereo ear buds. Perfect for travel, exercise, or motorsports, the CR10 is driven by a set of high quality drivers in a pair of full shell custom earpieces. Compatible with virtually any personal audio device these come with a 50-inch hardwired black cable and 3.5mm stereo plug. Ear impressions are required.